Mix 1/2 can of tomato soup and next 6 ingredients. 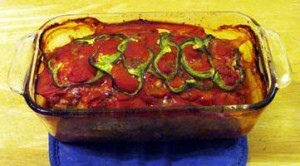 Place mixture in meatloaf pan. Cover meatloaf with the remaining 1/2 can of soup. Place slices of green pepper on top to add some sweetness and crunch to topping.